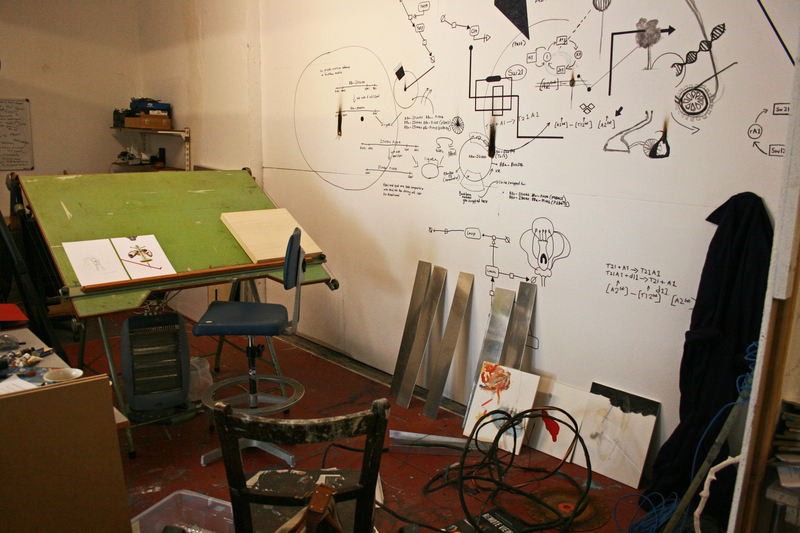 Lydia Holmes works from her studio at Array Studios in Belfast, Co. Antrim. Lydia is a multidisciplinary conceptual artist whose current work is very much inspired by the Futurist movement of the early 20th Century. Lydia wrote her dissertation about an exhibition called ‘Futurism’ in the Tate Modern in 2009. She studied the curatorial strategy behind the exhibition and her interest and research began to progress form there and it struck her how out-dated the work was. She learned that the futurist artists were inspired by fascism and that they produced a series of manifestos, co-written by Italian writer, Filippo Tommaso Marinetta. His manifestos were concerned with the fact that man must become a machine and how the futurists could recreate the universe with their new knowledge and constructions. They were determined to see man become better, faster and stronger. They glorified war and violence. Some futurists were interested in the notion bettering man by replacing food with pills and iron filings! Lydia sees the work of the futurists as brilliant but slightly obsolete. It is full of geometric, abstract shapes and is concerned with movement and speed. She has integrated abstract forms into some of her work but she is focused on creating something more contemporary. Lydia says that “although morally irrational”, she considers the literature the futurists produced to be “more informed and stimulating” than their draughtsman ship. Having read a lot about fascism and how it informed the futurists she is now interested in researching the area of current futurist fascists. I was interested to know what perspective Lydia looks at the Futurist Movement from. She said that she tries not to be negative, that you can look at it from the point of view that the futurists had the best intentions in mind; but then again, she says “if they had their way there would be all these bionic men running around with half machine bodies”. With her work, Lydia tries to take both the utopian and dystopian view, showing positive and negative sides of this world. She says that she does not want to create an explanation of why this new form was produced”, she wants the “attention to be focused on the eternal life of this new futuristic fictional structure”. Her work is colourful, fantastical and unusual. What inspired her to come up with these as yet unknown to us forms? She says that she tries not to think too much about it when she is creating the hybrid forms in her drawings and sculptures. She said gradually something will flow and it will be a natural progression from a form we recognise to something totally new but that has been informed by what we know. She is interested in keeping her representations as realistic as possible. She currently has an exhibition at Queen Street Studios, entitled “Bio-technia” which runs until 1st October. One of the paintings in the exhibition is of a group of ostriches emerging from an unknown plant – we don’t know what it is but we can imagine that it has evolved from something we once knew. 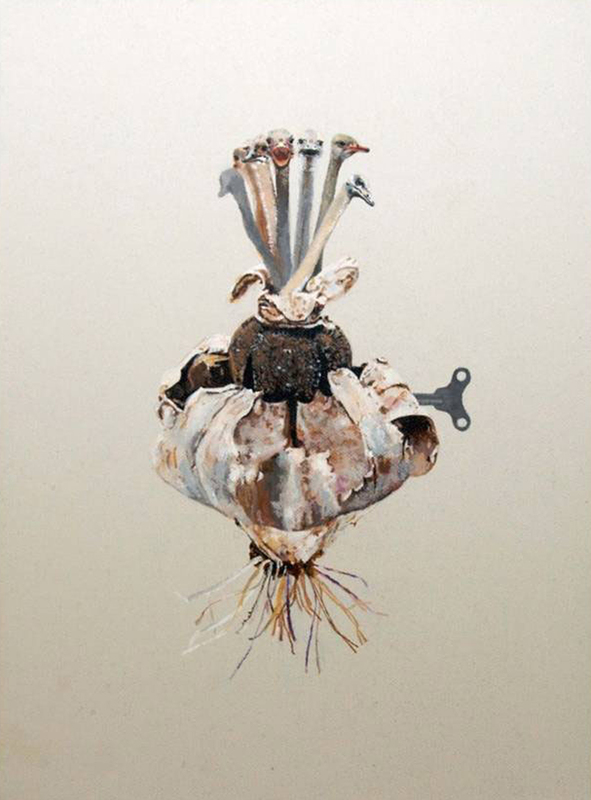 This, like some of her other work, shows anatomical and botanical influences. As part of her current exhibition Lydia has made some sculptural forms. She said they came about in quite a natural way, directly influenced by the Futurist Movement. She collected found objects both from the 1900’s and from now and has reconstructed them in such a way that they make a totally new form. A small tree with silver branches was made from deconstructed radio diodes. With some of her sculptures she is interested in representing what is possible through science now and is satirizing the cloning process and its results. Lydia is now interested in researching science through more deliberate and extensive methods. She has always been interested in science, especially in biology and anatomy, and now wants to combine her new scientific knowledge and her artwork and make work that is really relevant to current science. She finds the book ‘Art and Science’ by Sian Ede to be an interesting read and has also been researching in the archives at Queen’s University, Belfast. For her next body of work, Lydia is interested in collaborating with a scientist. She wants to learn more about the field and has been trying to organise an interview with a scientist as part of her research. She thinks that experience and expertise coming from both areas, science and art, could produce a really interesting work. 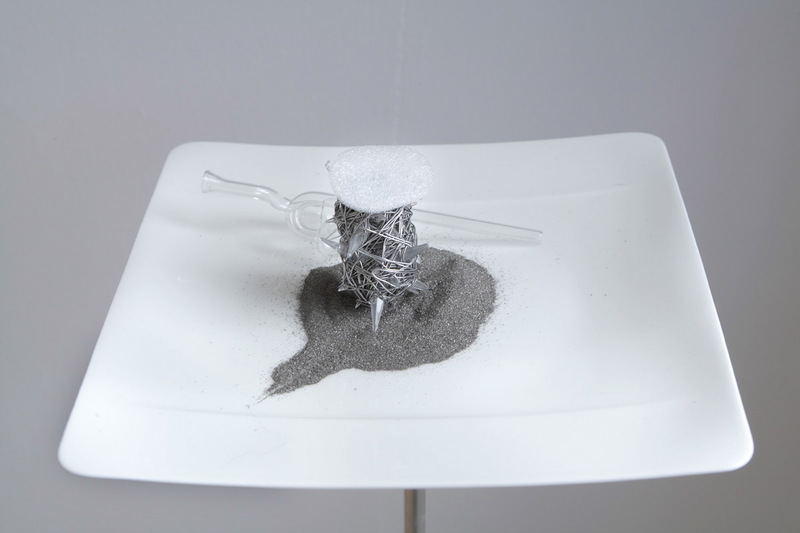 Lydia is interested in introducing more of a performative element to her art and recently she made a piece in her studio that she sees as a sort of parody of science. She replicated on a wall, an experiment she saw in a university archive video where scientists are trying to define what synthetic biology is. Because this is a relatively new area in science there are few definitive answers yet and so the scientists do not know exactly where the experiments are going and she said it was quite humourous to watch. Lydia did mock experiments using table fireworks stuck onto the wall over the wall drawing. 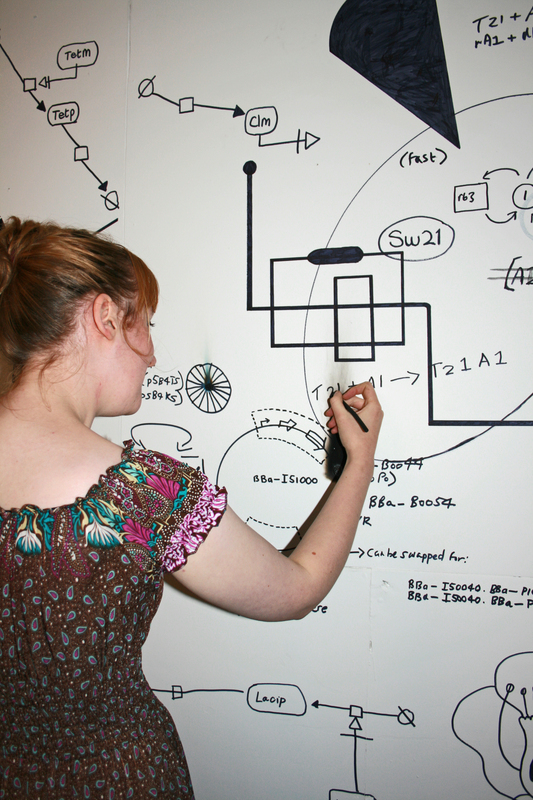 She is considering doing the wall drawing piece, which shows the same formulae the scientists use in the video, as a live performance. Synthetic biology is whereby synthetic organisms are created by combining science, technology and living forms. 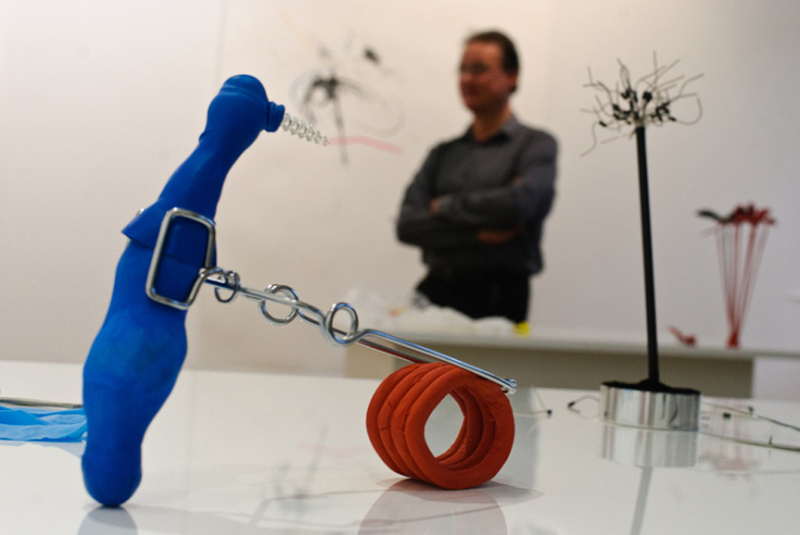 Its aim is to design and construct new forms not found in nature. Lydia says we should be thinking of the moral consequences of what this could become if it is not controlled. Her drawing “Them and those” is a parody of what could happen. 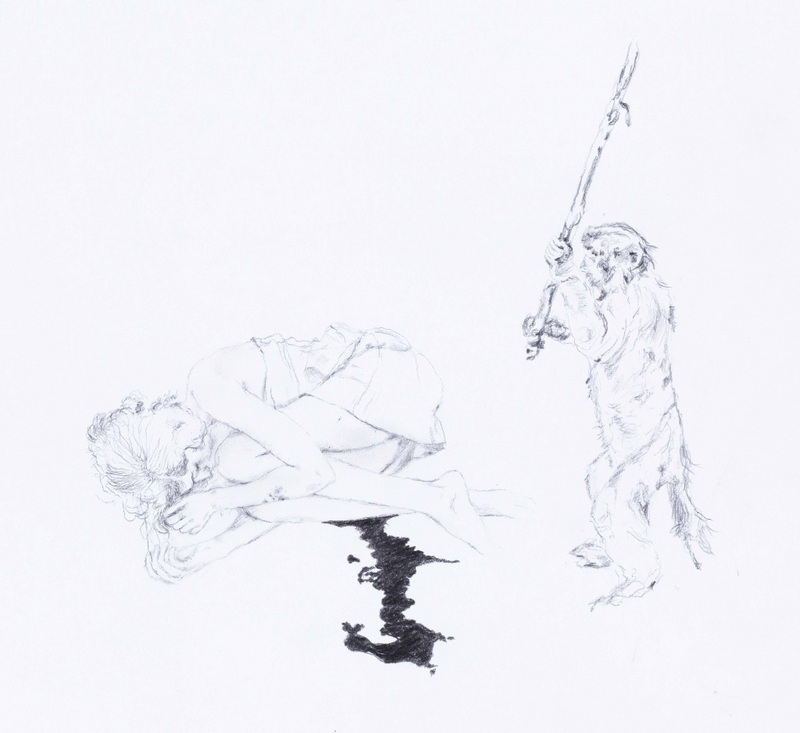 A monkey that has evolved through synthetic biology is standing in a threatening pose over a young girl. This new life that has been created could so easily go beyond the control of man. Throughout this year Lydia has been doing workshops in the community in Belfast with children and the elderly – a project formed by the Golden Thread Gallery. The project takes an artist led approach where at the end of the workshops the group produces work with the artist and the artist then shows work in response to this in an exhibition. Lydia hopes to continue her involvement in these workshops because as well as enjoying being active in the community it informs her work; it helps her keep momentum and inspires her practice.